Outlook PST File Password Unlocker is an innovative program designed to recover the password from various PST files. This utility permits users to choose one or more than one PST data file. This means, with this, users can reset the password from all the encrypted files in bulk. 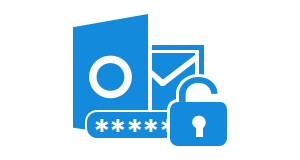 Removing password in bulk helps in completing the process in a very short period and completes the process quickly. 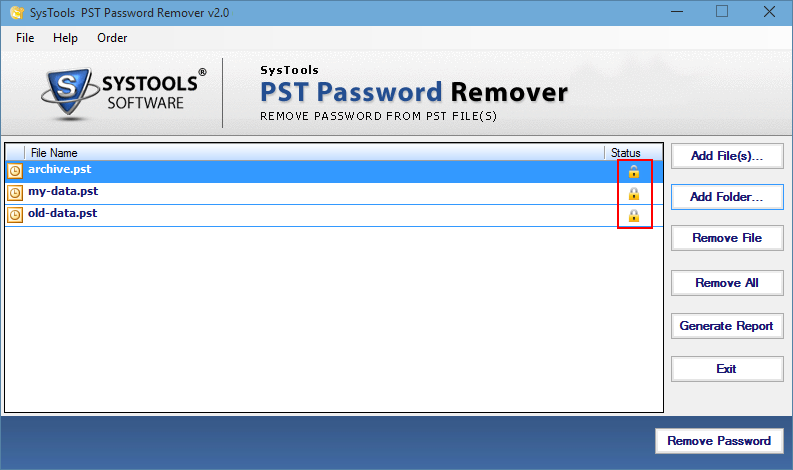 The pst password breaker software offers recovery of password protected PST files in a very rapid way. As soon as the old password is removed from the old PST file, which is chosen, users can store that decrypted file. Once it is done, they can put the password again as per their choice without any issue. The utility can eliminate any type of password, whether it is lengthy or multilingual. One of the useful features added to the pst password remover tool is that it supports all the versions of Microsoft Outlook. As the matter of fact, that Outlook comes up in different versions, it is designed to support every edition of it. Software is capable to remove the password of PST file, which belongs to Outlook 2003, 2007, 2010, 2013, and 2016. Both ANSI and Unicode types can be unlocked. 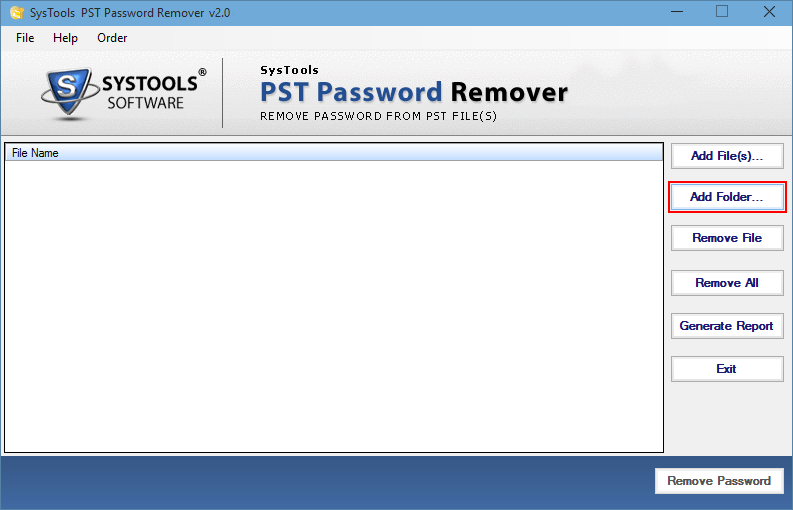 PST Password Remover belongs to a category highly technical program, which is designed with advance algorithms. It the potential to remove the password from all the PST files. In addition, the software does not require any other application for its working. This means, there is no need to install or even configure Outlook to decrypt a password protected file. It can be done, just with the help of this tool. There are many tools in the online market, however, users need something that is easy to handle or use. Considering this, the program has been designed in such a simple manner that even a novice can use it. It does not require any technical knowledge. After installing the process, users need to choose the required encrypted PST files to decrypt outlook pst them. Moreover, it takes very less time for the whole process. Windows operating system is the commonly used operating system. This is the reason that this software allows users to access the tool in any version of Windows Operating version. Uses who are using Windows 10, 8, 8.1, 10, etc. any version can install this application in their machine. This is one of the helpful features provided by this tool. Moreover, there is no limitation in the number of PST files. Can I split the resultant file with the help of this utility? No, it is not possible to split the decrypted PST file using this tool. For that, you need to use PST Splitter, which is a different utility. 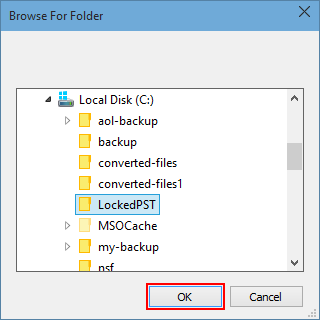 Is it possible to decrypt multiple Outlook PST files using PST File Password Remover? Yes, of course. The tool brings forth an interesting feature using, which you can reset the password multiple PST files. Does the software allow removing the PST file, which is added once in the panel of the tool? Yes, it is very easy to remove the PST file with Remove File option, which is added by you and do not need decrypt the file any longer. Can I get the old password back using this advance software? No, the tool does not provide with you the old password. It simply allows decrypting the file and after that, you can set a new file. Is it possible to access the tool in Windows edition 10? Yes, in fact, the software has such designing that it can be used in all the edition of Windows Operating system. 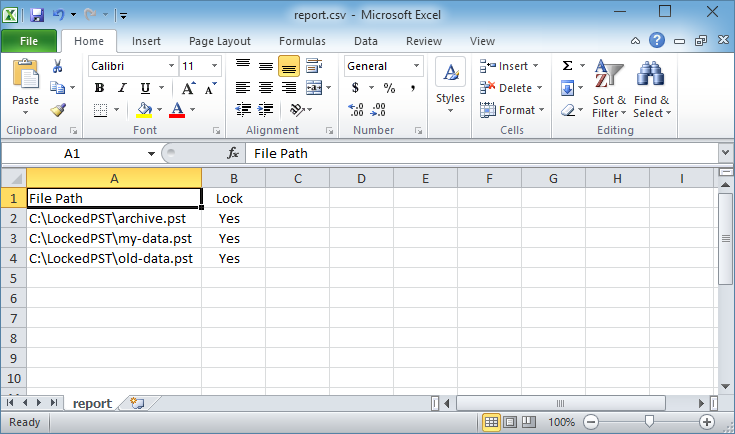 Choose Add Folder to eliminate the encryption from various Outlook data files at once. Now, select the desired folder and then click on “Ok”. "Last week, when I tried to open my PST files I realized that the files are password protected. I completely lost the password and therefore, I started to search any trick to remove the password from PST files. Then, fortunately, I got SoftwarePro PST Password Remover tool. With this, I unlock the Outlook PST files in a very easy manner. It hardly took 15 minutes for me to complete the process." "This is the best example of an amazing software with modern technology. Using this pst password remover tool, I have decrypted more than 50 PST files at once using this tool. The best thing I liked about the software is its interface. It makes it is easy to use the tool for a tech or non tech user. I want to pay my regards to the entire team of developers for such an innovative thinking."